The RMU has institutional accreditations from the Department of State for Education of The Gambia and the National Accreditation Boards of Ghana and the Republic of Liberia, for the running of its degree programmes. In fostering globalize academic cooperation, the University entered into intellectual networks with established institutions in the form of collaboration and affiliation. 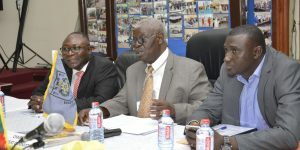 UNIVERSITY OF GHANA, LEGON for the Master of Arts (MA) in Port & Shipping Admin. programme. SMTC MALAYSIA – Offshore Oil and Gas Safety Training.